small robot with the ability to move around and avoid obstacles. It uses antennas at the moment but I´m planning to improve it´s sensor mechanism to use IR light. 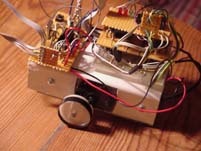 This robot was the part of my project in school. an object is near it also sends output to the motorcontroller. Two DC-engines with a simple "gearbox" from two similar CD-players. in a need of high current. The driver curcuits are fed with appr 10V. And because batteries or ackumulators are quite heavy, I´m using an adapter at this time. The only "expensive" part was the PIC.